The glamorous Cordis Hotel came to life last night as New Zealand’s hair and beauty professionals celebrated the 2017 Industry Awards. The night’s big winners were Buoy Salon & Spa and beauty therapy apprentice Machaela Robbins. Buoy Salon had much to celebrate as they were announced as the winners of the Kitomba NZARH New Zealand Salon of the Year award plus L’Oreal Grand Salon of the Year, Excellence in Marketing, and Best New Entrant. Buoy stylist Chinney Yeap added to the list as she took home Business Stylist of the Year. 2017 also marks 30 years since owner Derek Elvy set up his dream salon in Wellington. Referring to this milestone as ‘30 years of phenomenal’, Buoy’s success has truly been illustrated by their dominance at the Business Awards. Phillippa Middleton, managing director of Buoy Salon and Spa, said “Last night was an overwhelming experience. It was everything that we wished for and were trying to achieve for Derek and as we celebrate 30 years of business. We’re so incredibly proud and humbled to be the Kitomba NZARH New Zealand Salon of the Year”. HITO apprentice Machaela Robbins set a record for the awards, becoming the first beauty therapy apprentice ever to win the prestigious HITO Apprentice of the Year Award. Described as a “shining star” and an “inspiration” by the judges, this award tops off an already incredible year for this apprentice, who also won the Rising Star Award from internationally renowned skincare company DMK earlier in the year. The HITO Apprentice of the Year Award is the only award that acknowledges beauty therapy apprentices in training. “It is a huge honour to be named HITO Apprentice of the Year,” Machaela said. “It’s amazing to be the first beauty therapist to be represented at the Industry Awards with HITO. I can’t wait to take this and grow from it, and inspire and encourage other beauty therapists to enter”. 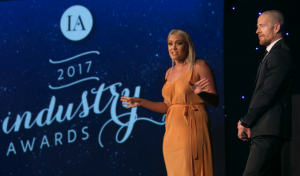 Buoy Salon & Spa and Machaela Robbins celebrated their success along with over 250 hairdressers, barbers, and beauty therapists at the 2017 Industry Awards held in Auckland last night. Al Quinn, CEO of Kitomba Salon & Spa Software said “the Kitomba NZARH Business Awards are all about building a culture of recognising and celebrating business excellence in the hair industry. We’re incredibly proud to be involved in this event and see our finalists and winners celebrating their achievements”. “These awards celebrate the apprentices who bring fresh ideas and talent, the trainers and employers who constantly renew their skills and help their trainees succeed, and the businesses and stylists who grow their communities, the economy, and New Zealand by striving for the highest level of service and professionalism. HITO’s very existence is based on nurturing skill and talent and helping our industries maintain a reputation of excellence, and we are honoured to be at the forefront of events such as this”. This event wouldn’t be possible without our hosts, judges and sponsors. A special thank you to: our hosts, Adrian Barclay of Venom Hair and Laura Williams of Ktizo Hair & Spa, the 2017 Kitomba NZARH Business Awards sponsors L’Oreal, Wella, Salon Business Coach and Comfortel, the Kitomba NZARH Business Awards judges Gary Marshall of L’Oreal, Seumus Cooney of Wella and Jacqui Victor owner of True Grit, and the HITO Next Generation Talent Awards judges: Bex Brent of Willis York, Nadine Gratton of Zabetti, and Ruth Irwin of Oscar and Co. This prestigious award recognises the overall best salon for 2017. They must display an excellent business model, fantastic use of marketing and the owner must demonstrate a true passion for their team, salon and the industry. They must also have business results that demonstrate they are worthy of being regarded as the best in the industry. This award is for salons with an annual turnover exceeding $600,000. In this award, judges look for a strong business with great all round performance. This award is for salons with an annual turnover up to $600,000. Here judges look for a salon that displays a results driven business with a focus on financials while creating solid plans for the future. Here judges look for a salon that demonstrates planning, innovation and creativity in order to achieve excellent results in marketing. In this category judges look for an outstanding workplace culture where staff feel nurtured and valued, and training is a priority. The employer must also display true passion for their business, staff and the industry. Here judges look for a business that is in serious growth mode. Growth in revenue, client numbers, and ultimately profitability. For this award judges look for a business with a conscious and innovative approach to minimising their impact on the environment. They also look for sustainable practices that are integrated into their everyday salon operations. In this category the judges look for a stylist with a passion for the industry who is excelling across a variety of key performance measures. For this award judges look for a salon that perfectly balances both form and function. From interior design to salon location and floor plan, it’s all about providing the right look and feel for your target market. For this award judges look at salons that are entering the Business Awards for the first-time. From these, they determine the all-round strongest entry. The Apprentice of the Year award goes to the best “all-round” hairdressing, barbering, or beauty therapy apprentice. The apprentice should show commitment to their training and the desire to improve in all areas. Each of the seven HITO regions will have their own regional winner. One national winner is picked from the six regional winners. The Trainer of the Year award goes to an exceptional industry trainer who trains HITO trainees. This Award is open to trainers in hairdressing, barbering and beauty businesses, including commercial product company trainers who have worked with HITO trainees. This award acknowledges an individual who offers excellent training. The Training Salon of the Year goes to a hairdressing, barbering, or beauty business that offers exceptional training to HITO trainees. The salon must show a strong commitment to training and qualifications and have an excellent record of training success in their business. This award acknowledges a business’ commitment to training. HITO and the Jasmine McBeth family set up this scholarship to recognise Jasmine’s passion, motivation and dedication to the hairdressing industry before she passed away in 2007. The scholarship is offered annually to someone with the drive, passion, motivation and dedication to succeed in their apprenticeship and hairdressing career. This scholarship is only available to those in a hairdressing apprenticeship.